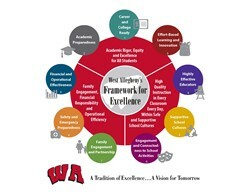 West Allegheny has established a legacy of excellence and a strong foundation that is represented by our successes in academics, arts and athletics. We recognize that through our students’ participation in arts and athletics they develop essential non-academic skills such as grit, perseverance, teamwork, discipline, tenacity, and the belief that effort creates ability. These essential, non-academic skills facilitate academic studies while preparing our students for college and the workforce. While our accomplishments are many, there remain areas for us to grow and a clear desire to focus on better results for all of our students. Our Framework for Academic Excellence builds on the District’s tradition of excellence so that all of our students are provided with the skills needed to compete globally, out-compete others for college placements and career opportunities, and prepare them for whatever they desire to do. The Framework identifies three priorities, which are nested in learning environments that ensure safety, foster students’ abilities, and support college and career readiness. 1. Academic Rigor, Equity and Excellence for All Students: Each student will have access to rigorous, equitable academic opportunities and excellence in teaching and learning to ensure career and college readiness. 2. High Quality Instruction in Every Classroom, Every Day within a Safe and Supportive Learning Environment: Each student will have access to a highly effective teacher in every classroom that challenges them academically, builds authentic relationships, and supports an effort-based mindset within an accepting and inclusive school culture that promotes engagement and connectedness. 3. Family Engagement, Financial Responsibility and Operational Efficiency: Effective family engagement, fiscal responsibility and operational efficiency in program delivery are essential to provide high quality academic programs and support services to our students so they may excel. Please see the unabridged Framework for Excellence on the right.